This is decidedly an unconventional portrait, but I think an interesting one. Also, it has an interesting story behind it. I shot this at the Amazon Resistance Radio venue that I talked about yesterday. In keeping with the underground resistance theme from “The Man in the High Castle”, there was a secret entrance to a hidden room. Strategically knocking on a bookcase, revealed a small hatch where Eugenia asks if you were part of the resistance. The correct answer opens the door, which is also the bookcase, which unexpectedly swings open. 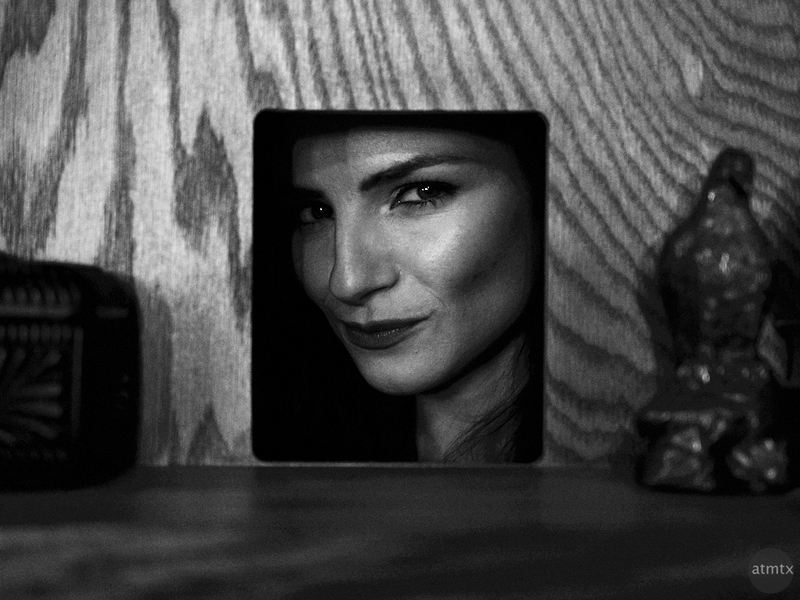 This framed portrait is Eugenia peering through the hatch. It’s a cute idea which revealed another large section of the bar, equal to the main area. You can see below, a more conventional portrait of Eugenia on the other side of the bookcase door. Also visible is the small hatch, to the right. I didn’t recognize Eugenia at first. But when she mentioned her — unique to me — name, I remembered meeting her once, at a Drink and Click. She was modeling bravely on a cold December night, back over a year ago. This portrait looks decently lit, but it was actually quite dark. I asked Eugenia to hold steady as I shot this at 1/10 of a second at ISO 3200 and f1.6. I wasn’t sure how well the image would turn out, but I was pleasantly surprised. I decided to convert the RAW to a black and white to bring out more details. Andy, I am enjoying the contrasty B&W images you and several other people are posting. They bring back memories of Tri-X. May I ask what B&W conversion you used? Thanks Rick, I’m glad you are enjoying them. Many of the black and whites are out of camera JPEGs from the Olympus PEN-F. The black and whites from RAW are done in Capture One software, using a third party black and white preset. I used a preset called “Kodak T-Max 3200”, which I adjusted slightly and added an extra film grain.